Good morning, good morning, and what a very special day this is! It is the first of the 2013 Christmas Quiltalong weekends - hurrah, hurrah, hurrah! So, I trust that you all have your Santa hats at the ready; a bowl of nuts in the fireplace; satsumas in the fruitbowl; crackers tucked in the tree (although that one not for me - my otherwise stalwart cats are surprisingly fey when it comes to crackers/fireworks, so let's be fair to them) and mince pies warming on the hob. This is also the season when alcoholic drinks in the morning are not frowned upon as an indulgence of the weak willed, so we'll take advantage of a sherry or Buck's Fizz, shall we - just to put us in the mood? Ooops - in the excitement, I quite forgot that our host this weekend, Joanna, will still be in the land of nod as I type (quite right too!). Shhhhhhhh, those of us living on the right hand side of the World Map - have patience! 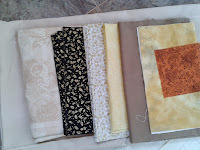 Let's use the time constructively - have you been thinking of QuiltSue's Christmas Challenge? Can you make a Christmas quilt NOT USING red and green fabrics? Is this possible??? Agh! Well, I have been immersed in my stash - I've put aside the reds and greens, and I'm looking at what we've got left to play with. Hmm. Good morning, good morning, and here's to a wonderful 2013 QAL. I am out of Nod and heading for the coffee maker. Have fun today. Good morning - I too, need to get the coffee going and then on to play. Looks like you've been busy already, Sharon! Hazel, have a fun weekend with the QAL...will be watching from the sidelines. Enjoy!